We will be selling small cocktails. 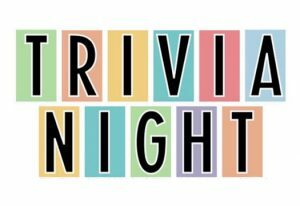 Trivia night will last from 7-9 pm. 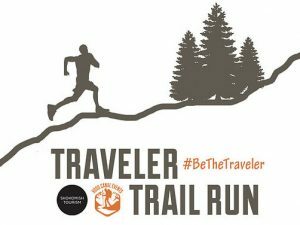 Hood Canal Events will hold its 3rd annual Traveler Trail Run at Skokomish Park, Lake Cushman, on Sept. 29. Packet Pick-up will be available on Friday September 28, 2018 between 5pm-7pm at The Hardware Distillery, 24210 US Hwy 101, Hoodsport, WA. 98548. Beat the rush, grab race details and a bite & taste some amazing local spirits while socializing with other participants. The Traveler Trail Run celebrates the end of summer on Hood Canal and supports the Olympic National Park! A portion of this year’s events’ proceeds will be contributed to the National Park Foundation. Early registration begins 8/1/18 and runs thru 9/28/18 – all race and event details are available for participants via the link found at http://hoodcanalevents.com located under the events tab. The Tides is just 3 miles North of the Distillery on beautiful Hwy 101. Price: $39 includes dinner and cocktails. I often wonder why we no longer “drop by” to visit friends, and why we sometimes make arrangements to set a time just to chat on the phone. When I was younger, my friends and I would visit each other un-announced. We would call each other, whenever we felt like it, just to chat. Now I never get those visits, and rarely those phone calls. I miss them. I don’t know if it is a cultural change, and people of all ages no longer make un-announced visits, or if it is simply that as we age our lifestyle changes. One possible cause could be that circumstances that are not important at a younger age, such as a messy house, become an embarrassment in our older years. Television has changed our lives. We used to watch the same shows at the same times. There was nothing else, and we knew when to call or visit without interrupting. Now we never know if we are interrupting a movie at its climax, so we don’t call. Instead we send a text to set a time for that call. Our friends who live locally stop by. So much better than a text. Feel free to stop by. We love catching up with old friends, and meeting new ones. 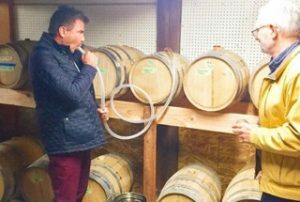 The Booze Traveler episode with The Hardware Distillery aired on the Travel Channel on April 23, 2018. It’s Episode 16 on Season 4. On Booze Traveler, cocktail connoisseur Jack Maxwell seeks out the people, places, customs and cultures behind drinks across the globe, and he spent a day with us, filming our distillery and helping us make a batch of HWY 101 for this episode. to celebrate the old Scandinavian tradition of aging barrels. Saturday, June 23, the Hardware Distillery is sending a barrel of aquavit across the Hood Canal on a boat at an event called Fjordin’Crossin. This event celebrates the old Scandinavian tradition of barrels of Aquavit sailing from Norway to Australia and back again. 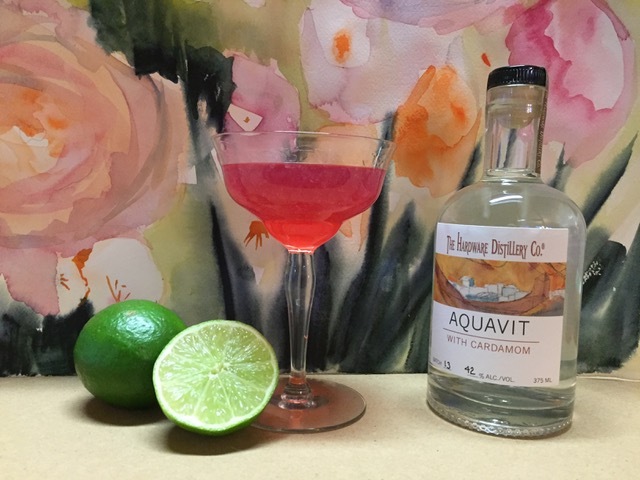 The Hardware Distillery’s aquavit will sail from Hoodsport to Tahuya and back again. The Paddle the Canal race sponsored by Hood Canal Events will follow the departure of the barrel. All kayaks, canoes, SUPs and other non-motorized watercraft are invited to join the race, which will start at the beach at the Hoodsport Dock. 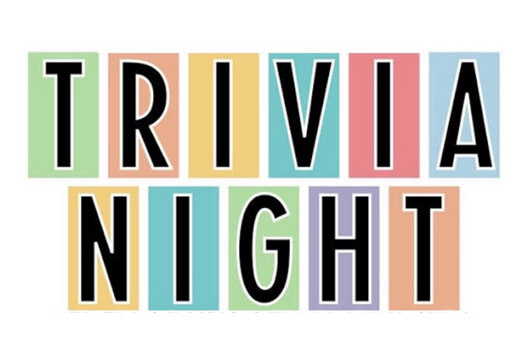 The race is a three-mile course, and there will be prizes. The Distillery will be open from 10 a.m. to 6 p.m., and will serving samples of their aquavit all day. 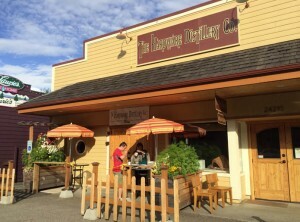 The Distillery is a very short walk from the Dock. When the barrel returns, it will be opened, and the spoils of its journey enjoyed. 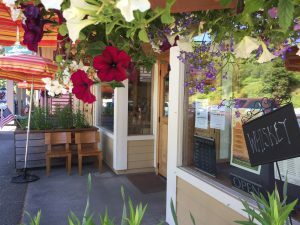 “In the shadow of the southeast Olympic Mountains, perched along the shores of Hood Canal, the small town of Hoodsport rests quietly, awaiting your adventure. For 125 years, Hoodsport has captured the imagination of everyone who passes through this sleepy hamlet along Washington’s often-overlooked fjord. Located just 45 minutes from Olympia, and a little over an hour and a half from downtown Seattle, Hoodsport has emerged as a must-stop location and a gateway to the Olympic Peninsula. 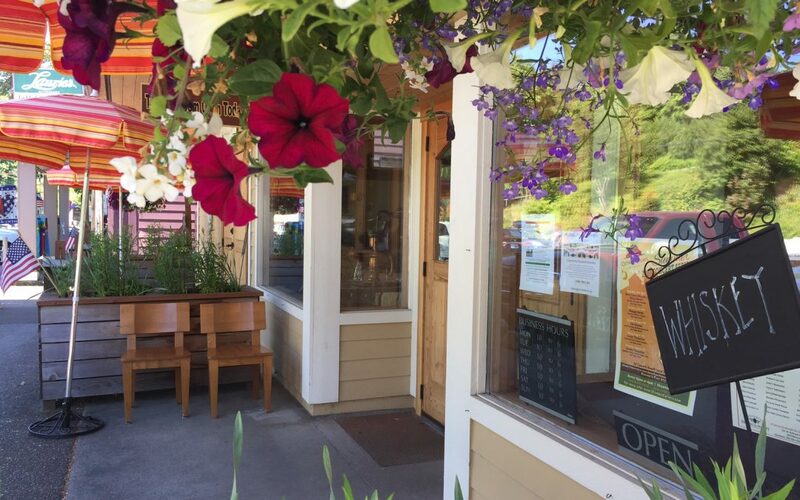 Hoodsport, located along the banks of Hood Canal, is beckoning for your next staycation adventure. “The town of Hoodsport isn’t big. In fact, it isn’t even technically a city. This unincorporated community in Mason County had only 376 permanent residents, according to the 2010 census. Yet, despite being a quick stop along Highway 101, Hoodsport is quickly becoming one of the Olympic Peninsula’s favorite towns. 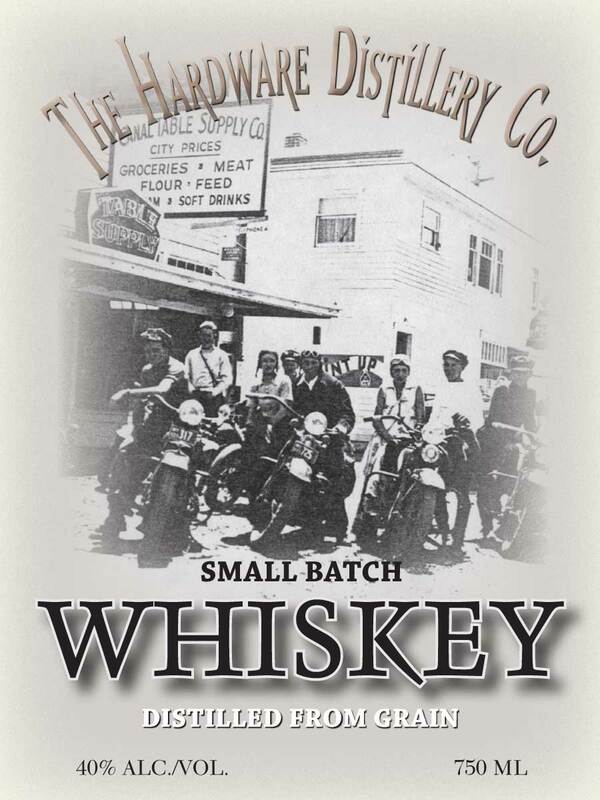 Our first batch of whiskey will be available at the distillery beginning April 3. For over a year, this first batch has been resting in white American oak barrels that were previously used to age our Fig Bee’s Knees. The fig and honey add a subtle complexity to our Scotch style whiskey. We will have approximately one hundred 375ml bottles from this first barrel. Additional batches of whiskey are still resting in Plumb, Peach, and Raspberry Bee’s Knees barrels. They will be available in the coming months and years. 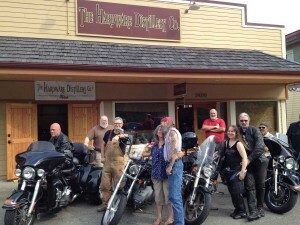 Scenic Highway 101 has always attracted sightseers as it winds its way around the Olympic Peninsula, and drivers and bikers have always stopped in Hoodsport. 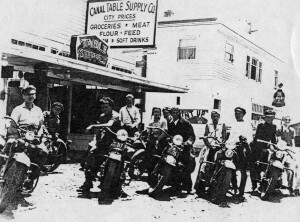 This 1930s photo of bikers in front of the distillery was taken when it was the Canal Table Supply store. We’ve always loved this photo, and it’s on our labels and t-shirts. Just like in the 1930s, these days bikers still stop in Hoodsport all summer long. When Snarl organized a visit to the distillery for a tasting with his friends, we hoped they would help us re-create our beloved historical photo. The weather cooperated, and they agreed to pose as much as possible like the old photo. This past summer we had visitors to our tasting room from all over the world. These happy girls from Japan were given t-shirts from visitors to our distillery. 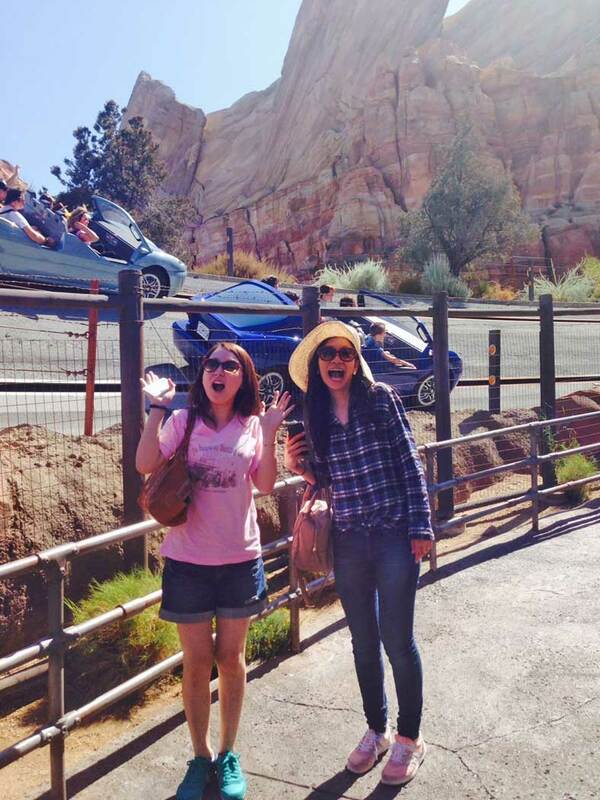 Here they are in California, wearing our pink t-shirts. Recently we visited Nancy and Steve, owners of Alpenfire, an organic cidery due north of our distillery. Their apple trees were in bloom. It was a sunny day and the air was vibrating. Normally I find the sound of hundreds of bees worrisome, but not to Nancy. As we walked through the orchard, the sound of her bees pollinating her apple trees made her visibly happy. Alpenfire is set in the hills in the Northeastern part of the Olympic Peninsula. Gentle hills and surround the organic cidery. We are going to be using some of their hard cider for our apple brandy. Pears are the basis of our vodka and aquavit. We purchase Washington State pears from a company in Vancouver, Washington. 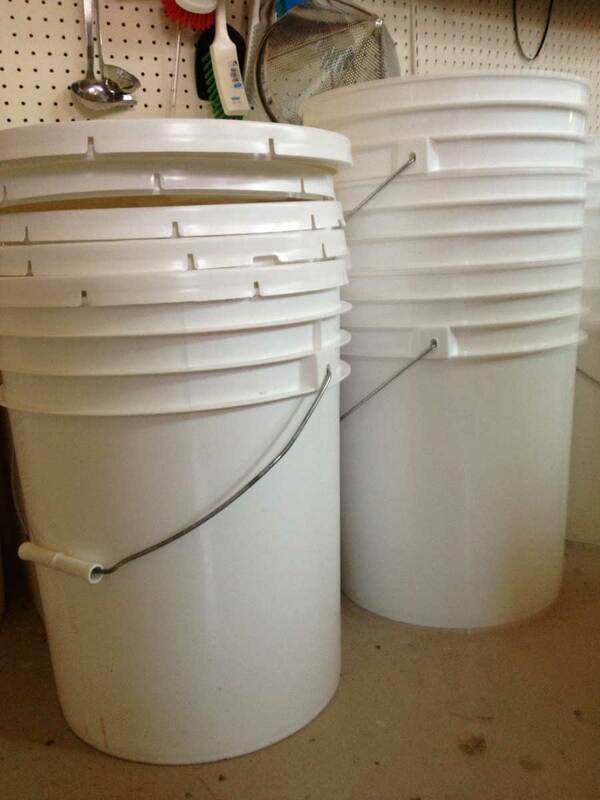 They are packed as concentrate in 5-gallon pails, which weigh nearly 60 pounds each. For each batch of pears, I drive our truck to Vancouver and bring the pails back to the distillery. The most recent trip was few days ago. I bought 24 pails. Sadly, this time the packers had not secured the pails of pear concentrate to the pallet. The pails were stacked two pails high, and as I entered the on-ramp to I-5, the top row of pails slid to the side of the truck, and tottered at the side edge of the back of the truck. They were ready to topple onto I-5. The next exit was a mile away. I drove very slowly in the right lane, constantly checking my rear-view mirror and the sight of the white buckets, bent against the side of the truck. As I reached the exit, I looked for someone to help me. I am not strong enough to move the 60-pound pails. There was a small shopping center. I knew that there would be no one to help me at the small shops. Then, I spied a charity donation center. When I parked, several people told me that the pails were ready to fall out of the truck. I thanked them for the information. Two young men were at work at the donation drop-off. I offered them $20 to straighten the pails. They agreed, but said no one could see them accepting the money. After the pails were straightened, the $20 was passed via a handshake. I was back on I-5, and on my way to making vodka and aquavit.